Whether you're loyal to Snapchat or Instagram's new update has won you over, chances are either way you've stickered a selfie or two with your favorite emojis (flying money and pizza top our list). Now, you don't even need a sticker to show how you really feel, you can wear your emotions (or really, emojis) thanks to Acne Studios. The downtown-cool brand has launched a new capsule collection inspired by your favorite little images. The perfect sweatshirt is emblazoned with a doughnut, and let's not forget a sweater covered in hot dogs, plus there's an emoji-emblazoned baseball cap too—we consider them all must-haves for the coming months. The fun, funky pieces make an irreverent statement, and we can't help but totally love it. So, no matter how tech savvy you consider yourself, you'll want to add this cute collection to your shopping list. Check out a few of our favorite pieces from the collection below! 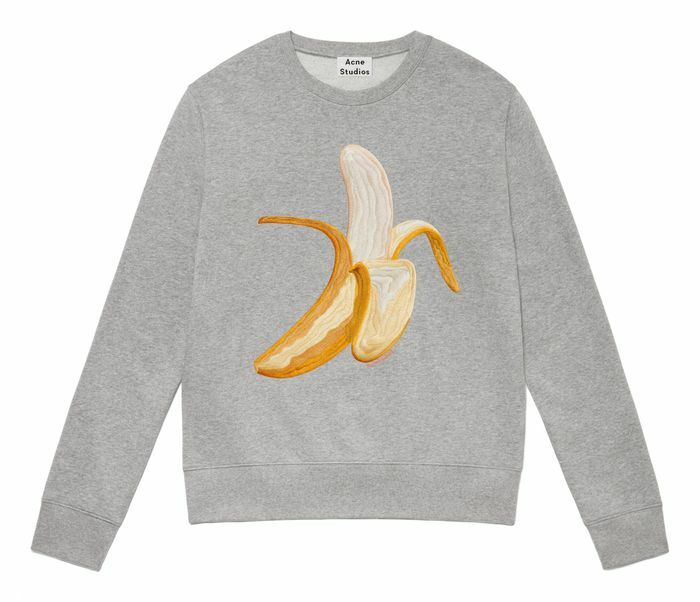 You won't slip up dressed in this banana sweatshirt. How can you say no to a doughnut? A hat gets a hilarious twist thanks to cute patches. You'll be one hot dog in this piece.